During the mating season, the female sits on a nesting ring while the males searches the entire beach for the pebbles looking for the smoothest one to present to their chosen female. Once a pebble has been selected, the male penguins presents the pebble as a token of love to the chosen female and if she takes the pebble and places it on her nest then she has accepted that penguin as her mate. Love quotes... "Love is not about how much you say, 'I Love You' but how much you prove that its true". 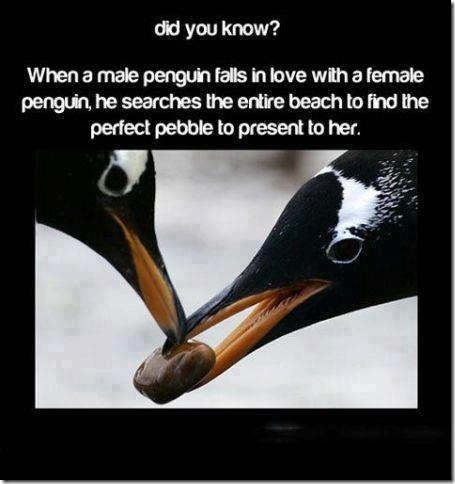 Does this mean that females like stones...? I believe women won't be just impressed with words but with something to see as well. Words are pleasant to the ears but the sighting with the eyes are even more powerful. If you just say these three words... "I love you" to your home sweetheart, she would be happy. But if you say them with a diamond, she will be thrilled. Right? Do it tonite for the sake of love, and your sweetheart will love you even more. Haha!